Saved from Bleacherreport.com. Credit: WWE. Kevin & Shahid are hitting the airwaves this week to talk about the recently concluded Smackdown Live. What did Kevin not realize Kevin said during the Miz‘s big rant last week about Daniel Bryan? Is it better to have a great career for seven years or an average career for ten and counting? How many people can really say they went into the Wrestlemania main event and retained their Championship as a heel? What can be said for the tag team division on SD Live? Does Mojo Rawley really bring something to the table? How quickly have the Vaudevillains fallen in their short time in the WWE? Why are all of the teams winning the tag team tournament baby face teams? Did the Usos wash the stink of Roman Reigns off of them? Will they be a good challenge for American Alpha in their first feud? Will it allow the other teams to develop? 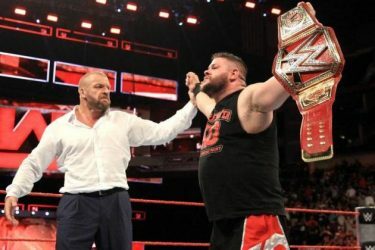 The guys pivot to Raw and of course talk about the biggest angle on that show, HHH helping Kevin Owens win the Universal Championship. Why are people so mad about this angle already? Shouldn’t they let it play out? Haven’t we been through this drill before? Can we stop pretending like the WWE has two champions who used to be deemed unworthy in the WWE with Owens and Dean Ambrose? Is Cesaro going to become the next Dolph Ziggler? Would he get a better chance to succeed on Smackdown? Why is Sheamus one of the only heels going over clean? Shahid & Kevin finish up the show by talking about the rumor that Vin Diesel and The Rock are going to have a match at Wrestlemania? Why was one of our esteemed colleagues worried about the potential match quality of such an affair? Isn’t it just great that The Rock brings his highest paid actor credentials along to the WWE? What else do the guys talk about? Click on the link to find out.